Among other exercises and activities, participants were asked to select a social issue and depict it using a combination of Legos, pipe cleaners, and various other items. Following that activity they were asked to depict their vision of that problem resolved using the same materials. Above are photos of some of the creations that were developed. Issues of corruption, environmental degradation, education, and health were all issues that were mentioned in the context of Colombian society and in particular in Afro-Colombian communities. Students participating in the Bogota seminar hailed from San Andres/Providencias, Chocó, Tumaco, and other parts of Colombia. Students participating in the Quibdó seminars hailed from all parts of Chocó. The next installment of the seminars will take place in the spring in Cali and Cartagena, Colombia. Every month Phelps Stokes’ Programs for Africa and Freedom Endowment hosts a Palaver Hut, a symposium that creates an environment of productive dialogue on an important issue. This month’s event is entitled, “Women’s Entrepreneurship and International Partnership”. We are extending an invitation to you and hope to see you there. Space is limited, so please RSVP to Abigail Simmons at ASimmons@phelpsstokes.org. For more information about Phelps Stokes’ Programs for Africa & Freedom Endowment, visit www.phelpsstokes.org or contact Director of Programs for Africa & Freedom Endowment Pape Samb at PSamb@phelpsstokes.org. 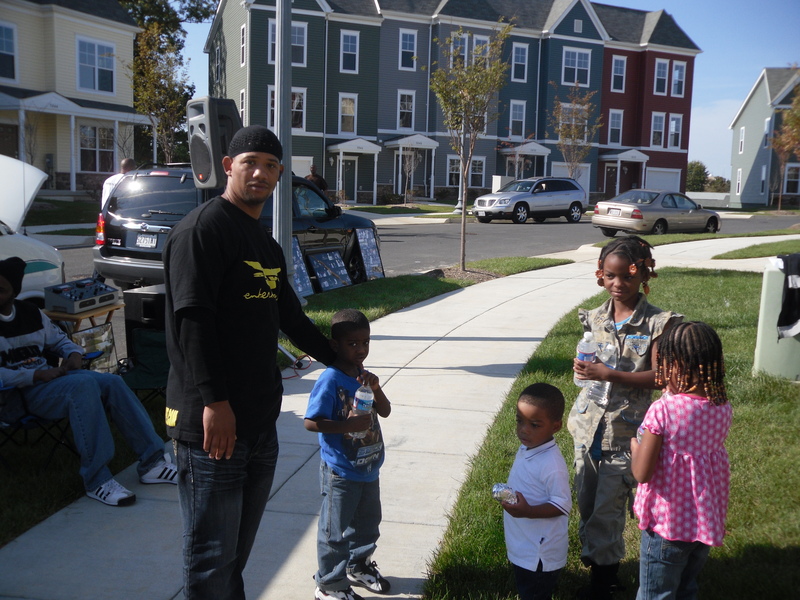 On September 15, 2011, The Washington Post interviewed the Director of Phelps Stokes‘ National Homecomers Academy Program, Curtis A. Watkins about the great work of NHA’s Community Change Agents as they participate in morning patrols aimed at giving kids ‘Safe Passage’ to school in the DC area. The article mentions that four times a week, Curtis Watkins and a group of National Homecomers also known as NHA Community Change agents walk the streets of Marshall Heights and Lincoln Heights in Ward 7, greeting students and making sure that the students arrive to their designated school safely. Read the recent Washington Post article “In Ward 7, Men’s Morning Patrols Aimed at Giving Kids ‘Safe Passage’ to School” to find out more about the interview with Director of the National Homecomers Academy, Curtis A. Watkins. For the latest information about the National Homecomers Academy, visit www.phelpsstokes.org/About_NHA or contact Mr. Watkins at CWatkins@PhelpsStokes.org. Several countries in Africa are reforming the curriculum in schools. According to www.Standardmedia.co.ke, Former President of Kenya, Daniel Moi, recently urged reformers to take their time. He believes the issues with the current education system should be looked at with a critical eye instead of being completely scrapped. The article mentions that Moi fears that a quick adoption of new policies could create more issues and he believes that Kenya shouldn’t base its education system solely on one education model.” Moi also believes that education is essential to Kenya’s progress, but the institutions of learning need to be managed properly. For more information about Kenyan Education reform, visit Standard Media. After the shocking earthquake in Port-au-Prince, Haiti, many schools were heavily damaged. During the earthquake, many students were killed in schools that collapsed. Four earthquake-proof schools are under construction in Port-au-Prince. The structures are also expected to hold up against hurricanes as well. The schools are made of rebar, cement, and foam to allow the structure to bend and not collapse in the event of a severe hurricane or earthquake. Many students have yet to go back to school since the devastating earthquake. For more information about this topic, visit Local10.com. Show Phelps Stokes’ Programs for Africa & Freedom Endowment some support by attending the Palaver Hut series on Thursday, June 30, 2011 at the Club Quarters Hotel in Washington, D.C. (839 17th Street). The panelists for this month’s event are Nick Zemura, Founder of Mirazvo Productions; Jean-Patrick Guichard, Founder and CEO of Guichard Solutions; and Rahel Getachew, Founder and Managing Director of Afrolehar. Phelps Stokes’ Programs for Africa & Freedom Endowment focuses closely on education initiatives in Africa. For more information on this month’s Palaver Hut, contact Abigail Simmons at asimmons@phelpsstokes.org. For more information about the Programs for Africa & Freedom Endowment, visit www.phelpsstokes.org. Watch the video tell us what you think! Tweet the Hastag #PAFEPalaverHut if you will be attending this month’s Palaver Hut! Every month Phelps Stokes’ Programs for Africa and Freedom Endowment (PAFE) hosts a Palaver Hut, a symposium that creates an environment of productive dialogue on an important issue. 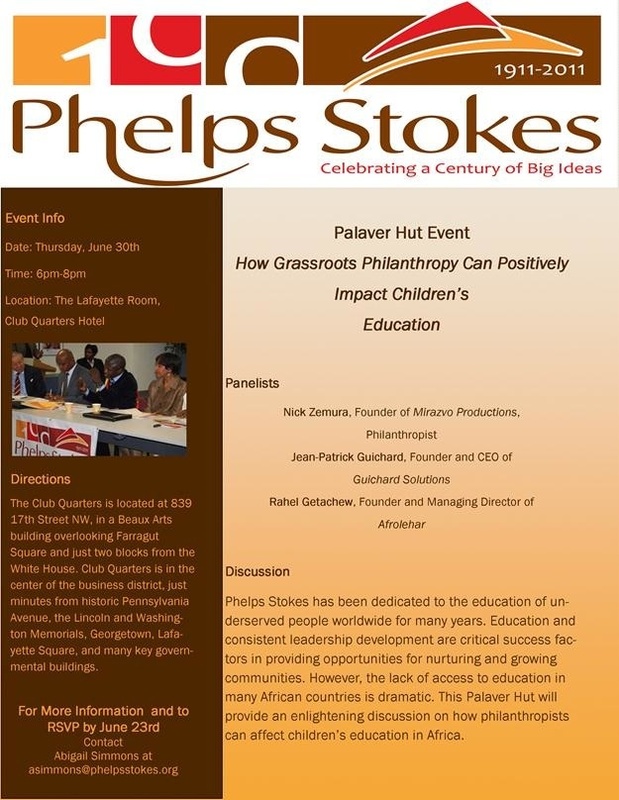 June’s Palaver Hut event is entitled, “How Grassroots Philanthropy Can Positively Impact Children’s Education”. The event will be held on Thursday, June 30th, 2011 in the Lafayette Room at Club Quarters Hotel Washington, located at 839 17th Street NW, DC from 6:00 pm to 8:00 pm. Please RSVP by June 23rd, 2011 to Abigail Simmons at asimmons@phelpsstokes.org. Support Phelps Stokes’ Programs for Africa & Freedom Endowment by coming out to the Palaver Hut and engage in the conversation! We hope to see you there! For more information about Programs for Africa & Freedom Endowment’s June 23rd Palaver Hut on “How Grassroots Philanthropy Can Positively Impact Children’s Education,” contact Abigail Simmons at asimmons@phelpsstokes.org. Twitter is slowing becoming more and more popular. Twitter was created in 2006 and has earned its title of, “The SMS of the Internet.” Twitter states, “At Twitter, we believe that the open exchange of information can have a positive global impact. Every day we are inspired by stories of people using Twitter to help make the world a better place in unexpected ways.” Several non- profits and community organizers have used Twitter as a way of spreading their message worldwide. Twitter was inspired to create, “hope140”. Hope 140 is a campaign of sorts to encourage more non-profits to join the SMS based site. The name plays off the 140 characters limit of every tweet. @RoomtoRead is the perfect example of how to use Twitter for a good cause. Room to Read is an educational based program that started in Nepal. The program, that started in 2000, now works in Bangladesh, Cambodia, India, Laos, Nepal, South Africa, Sri Lanka, Vietnam and Zambia. It is organizations like, Room to Read, that have benefited tremendously from Twitter. Twitter hopes that more and more positive organizations will use Twitter as a platform. For more information on Room, visit www.RoomToRead.org. Click here to read more about Hope140. Uganda prefer to marry their daughters off. 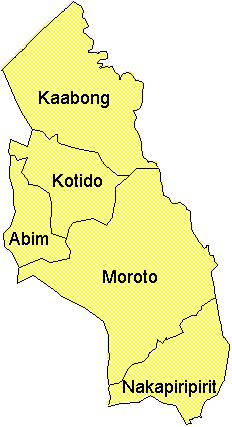 Uganda’s The Independent, reports that only 10 percent of all children in the region finish school. For more information about this topic, visit http://allAfrica.com. 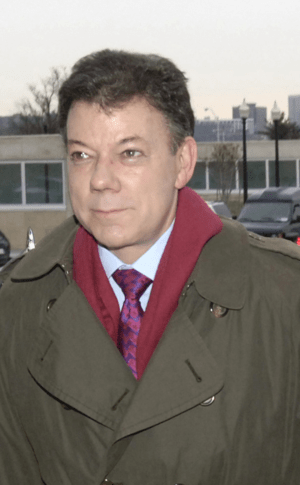 According to an article on ColombiaReports.com, Colombian President, Juan Manuel Santos announced the creation of a bill that will support the fair treatment of Afro-Colombians. The Law of Equal Opportunities for Afro-Colombian Peoples will present the bill to congress on July 20, 2011. July 20th marks Colombia’s Independence Day and the beginning of a new parliamentary year. The government first made steps to criminalize racism in November of 2010. Individuals convicted of racism would have to spend up to six months in jail or pay a fine of $4,000. Many Afro-Colombians live in poverty and don’t have access to proper education. The situation in Colombia is reminiscent of a 1950s America. Santos feels that it is Colombia’s duty to right the wrongs of the past. Santos has also created a program entitled, “The Presidential Program for the Integral Development of Black Communities.” The program will be dedicated to finding resolutions to help mediate the problems facing Afro-Colombians. For more information about this topic visit http://ColombiaReports.com. Enter your email address to subscribe to A Century of Bid Ideas - The Phelps Stokes Blog and receive notifications of new posts by email. Are you tweeting about Phelps Stokes? Add Phelps Stokes on Facebook! Follow Phelps Stokes on Twitter! Enter your email address to subscribe A Century of Big Ideas - The Phelps Stokes Blog and receive notifications of new posts by email.